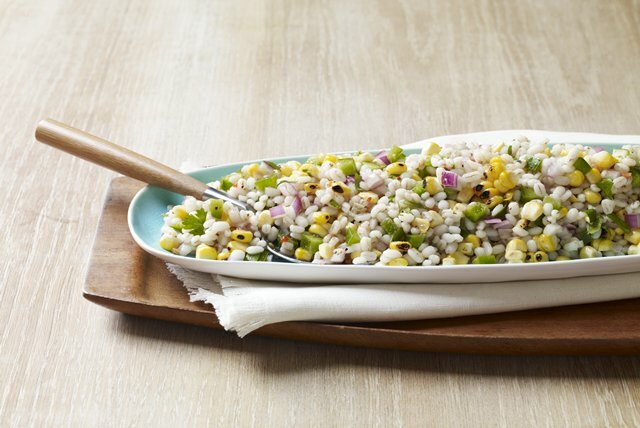 No need to fire up the grill to make the fresh-cooked corn in this Southwestern Barley Salad. You can do it right on the stovetop! Cook barley as directed on package. Meanwhile, place corn ears directly on stovetop flame on medium-low heat; cook 4 min. or until corn is evenly roasted, using tongs to frequently turn ears. Cool 5 min. Cut kernels off cobs; place in medium bowl. Add all remaining ingredients; mix lightly. If you don't have a gas range or if fresh corn is unavailable, you can use 1 drained 11-oz. can corn instead. Cook and stir drained corn in nonstick skillet on medium heat 10 min. or until kernels are roasted around the edges. Continue as directed. Add 1 rinsed 15-oz. can black beans to salad.